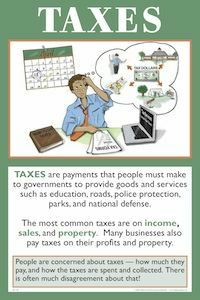 TAXES are payments that people must make to governments to provide goods and services such as education, roads, police protection, parks, and national defense. The most common taxes are on income, sales, and property. Many businesses also pay taxes on their profits and property. People are concerned about taxes - how much they pay, and how taxes are spent and collected. There is often much disagreement about that! Taxes are required payments that people and businesses pay to support all levels of government services - national, state, and local. Governments provide many of these services because they would not be provided in sufficient quantities if left to private enterprise alone. People pay many kinds of taxes. The most common are taxes on income, consumer purchases (sales), and property. Many businesses also pay taxes on their profits. 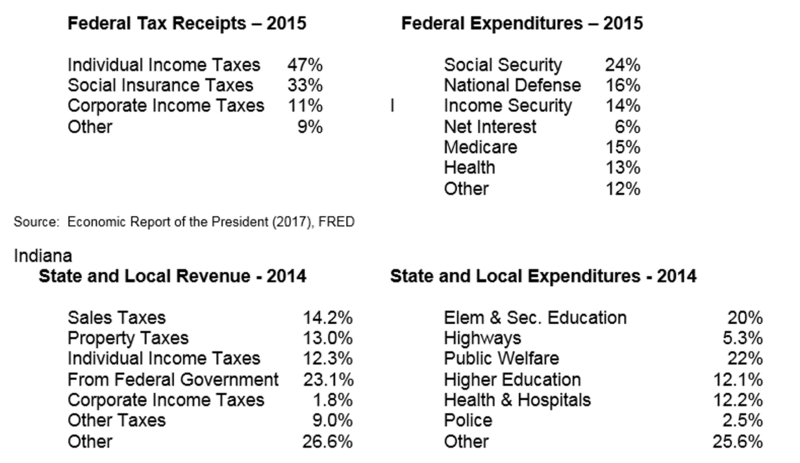 Below is a graph of federal government tax receipts and expenditures. The same data is provided for state and local governments. The role of government in the economy has increase significantly in the United States. In 1929, government expenditures accounted for about 2.9 percent of our national output (GDP). In 2015, that figure was about 20 percent. Have students research all the different kinds of taxes they pay. They will be amazed at how many there are. Challenge students to figure out how much in taxes they pay each week. Have students create pie graphs and/or bar graphs using the Federal and State/Local government data above. Create a bulletin board entitled: "How Are Our Federal Taxes Used?" Using the data above, have students research examples for each expenditure category, such as food stamps under "income security" or disability payments under "social security." Do the same for the other pie graphs. Have students debate, then write a short essay on either or both of these very relevant statements about tax policy. - "People who don't pay taxes should not receive government services." - "Everyone should help pay for services, even if they don't use the services themselves." Tic Tac Taxes lesson found in the lessons for grades 3-5.